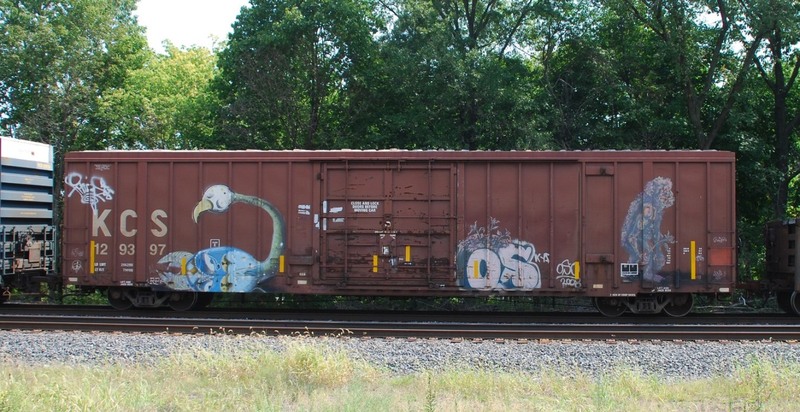 A Sasquatch sighting along CSX's Trenton Line! Click on the picture to see it enlarged. Then use your browser's BACK button to return here. Pictures below are from Lehigh Lines, Fall 2015 (Vol. 60, Issue 3) a quarterly magazine of the Railroad Historians of the Lehigh Valley. Copies of the magazine are available for $6. 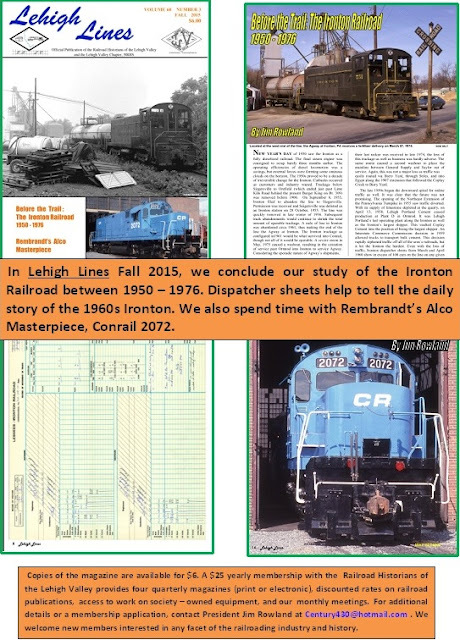 A $25 yearly membership with the Railroad Historians of the Lehigh Valley provides four quarterly magazines (print or electronic), discounted rates on railroad publications, access to work on society-owned equipment, and our monthly meetings. For additional details or a membership application, contact president Jim Rowland at Century430@hotmail.com. We welcome new members interested in any facet of the railroad industry and history. ARLINGTON, Va. (September 3, 2015) - CSX and The Conservation Fund have teamed up for a second year with the West Virginia's Department of Agriculture and local organizations to promote healthy eating habits and increased access to local produce for hundreds of children and families in McDowell, Roane and Mingo counties. The program is providing coupons to help make locally-grown fresh foods more convenient for purchase, financial assistance for mobile and school-based farmers markets, and nutrition and healthy eating classes. New this year, classes will also be held on vendor recruitment, customer service and basic accounting to assist with the long-term viability of the farmers markets. Throughout the summer and fall, children and their parents in McDowell and Roane County can shop for local produce using "Kids Koupons" and participate in food tastings and nutritional demonstrations at farmers market events at their local schools. Families with children who use Supplemental Nutrition Assistance Program (SNAP) dollars will receive double the amount of healthy food vouchers for every dollar spent at the markets on healthy food. Around 250 children from each county will receive the vouchers. Through additional program funds, farmers markets will team up with the federal SNAP to provide cooking demonstrations and distribute recipes and information on cooking, storing and preparing fresh, seasonal food. This will provide opportunities for kids to sample and become familiar with how to prepare new foods, so that the families can learn healthy recipes and incorporate them into their normal eating habits. Mobile markets in Mingo County will also bring fresh fruits and vegetables to residents in eight communities through Farm Fresh 4U. "This summer we have already reached over 100 families in Mingo County with our Farm Fresh 4U Voucher program," said Maria Arnot, Director of Community Agriculture with Mingo County Diabetes Coalition. "Also this year, we have started a double bucks incentive program that will encourage families to use their SNAP benefits at our mobile farmers markets. By matching what they spend up to $10, we hope to gain and retain customers." The Conservation Fund works with West Virginians by protecting natural resources, which in turn support local economies and business owners and improve the lives of residents. "The overall health and well-being of our children is directly affected by what they eat, and for many low income families in food deserts, healthy options are oftentimes simply out of reach," said Kris Hoellen, Senior Vice President of Sustainable Programs for The Conservation Fund. "By expanding access to fresh produce and giving children opportunities to shop, taste and learn how food goes from the farm to the table, we're creating markets for local farmers, and most importantly giving children and their families the opportunity for a long-term healthy lifestyle. 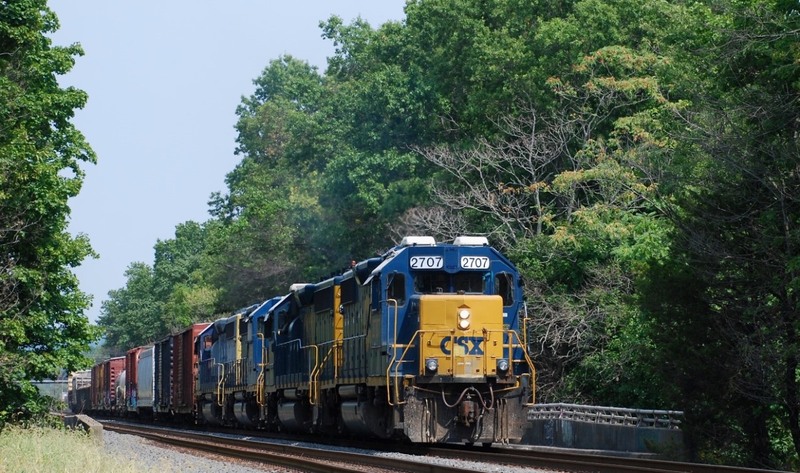 We're proud to partner with CSX in this important and impactful program." As one of the nation's premier transportation companies, with an important role in transporting agricultural and food-service products, CSX recognizes that there are communities across its network that lack the fresh foods that are essential for human health. "Our partnership with The Conservation Fund has helped us create actionable, solution oriented programs - like the Kids Koupons - to address the critical issues facing the communities where we live and work," said Randy Cheetham, regional vice president for state government and community affairs, CSX. "West Virginia is an important piece of the CSX network, so we're especially proud to be able to have programs like this to give back to the state that has supported our success with its businesses and skilled employees." NORFOLK, Va., Sept. 3, 2015 – Norfolk Southern Corporation (NYSE: NSC) Executive Vice President Finance and Chief Financial Officer Marta R. Stewart will make a presentation during the 2015 Citi Industrials Conference. Where: The Ritz Carlton, Boston Common, Boston, Mass. NORFOLK, Va., Sept. 2, 2015 – Norfolk Southern Corp. (NYSE: NSC) said it is realigning the reporting structure for two key departments. Effective Oct. 1, 2015, NS’ Strategic Planning department will report to James A. Squires, president and CEO, and NS’ Information Technology department will report to Cindy C. Earhart, executive vice president administration. The Strategic Planning and Information Technology departments previously reported to Deborah H. Butler, executive vice president planning and chief information officer, who announced her retirement effective Oct. 1, 2015. Earhart joined NS in 1985 and has served in positions of increasing responsibility in accounting, IT, and human resources. She was named executive vice president administration in 2013. John H. Friedmann, vice president strategic planning since 2008, and Fredric M. Ehlers, vice president information technology since 2013, will report to Squires and Earhart, respectively, under the new structure. Butler’s retirement comes after a 37-year career centered on transportation, customer service, planning, technology, and sustainability. JACKSONVILLE, Fla., (September 2, 2015) - Fredrik Eliasson, CSX Corporation (NYSE: CSX) executive vice president and chief financial officer, will address Cowen and Company's 8th Annual Global Transportation conference in Boston on Wednesday, September 9, 2015, at 8:00 a.m. Eastern Time. Access to the webcast will be accessible through http://investors.csx.com. A replay and accompanying audio will be available following the conclusion of this event. NORFOLK, VA., August 31, 2015 -- Mark Kalina Jr. survived being run over by a freight train, but he lost both legs in the accident. In a gripping new safety video produced by Norfolk Southern, Kalina warns of the tragic consequences of trespassing on railroad tracks. "I'm kind of a shock-and-awe story because I can physically show people what can happen if they trespass on railroad tracks,” Kalina says. "I hope when people hear my story, they will learn from my mistake so they don't make the same one." Norfolk Southern is encouraging colleges and universities with campuses situated near railroad tracks to share the video with students. “If we could make more people aware that it’s not only illegal, but very dangerous, to walk on railroad tracks, I think we could save a lot of lives,” Kalina says. In the video, Kalina recalls the October 2012 night when he decided to take a shortcut home across the railroad tracks near The Ohio State University, where he was a civil engineering student. As he walked around a stopped train, he slipped on some gravel and snagged his shirt on a rail car -- just as the train started moving. Unable to free himself, Kalina climbed onto a ladder on the car but lost his balance and fell. His body was pulled underneath the train. Lying on the tracks, Kalina used his cell phone to call for help. The video uses the actual recording of his 911 call as he directs a helicopter to his location. It also features a re-enactment of the accident. The train severed both of Kalina’s legs and most of one pinky finger. He spent 17 days in a hospital and then weeks in rehabilitation learning to walk on prosthetics. Since then, the 25-year-old Twinsburg, Ohio, resident has dedicated himself to promoting railroad safety. He travels across the country as a spokesperson for the rail safety organization Operation Lifesaver, supporting its See Tracks? Think Train! trespasser prevention campaign. Last year, 495 people across the United States lost their lives while trespassing on train tracks, a 15 percent increase compared with 2013, according to Federal Railroad Administration statistics. An additional 415 people were injured. Currently attending Cuyahoga Community College in Cleveland, Ohio, Kalina is also the founder of the nonprofit Mark Kalina Jr. Foundation, which supports others who have lost limbs due to traumatic accidents. I wondered how long before someone tried hauling fresh water to California and elsewhere. A 75-car unit tank train would be able to transport over 2 million gallons at a time. ---N.
"Water Train Inc., an operating unit of Modoc Railroad, began solicitations of private entities and municipal governments to participate in the operation of a water test train. The test train will contain 190,000 gallons of U.S. Environmental Protection Agency-approved, treated and cleaned water designed for agricultural or groundwater recharge use. Although the train will arrive too late in the year for most row and stone fruit crops, it will give potential water train users time to identify and develop unloading and distribution sites, company officials said in a press release." ATLANTA, Sept. 1, 2015 -- With Georgia Gov. Nathan Deal on hand to celebrate the success of a public-private partnership for cleaner air, Norfolk Southern today unveiled the nation’s first of a new class of rail yard locomotives developed with federal funding assistance to reduce emissions in urban areas. Gov. Deal and Mark Manion, Norfolk Southern’s chief operating officer, dedicated five of the locomotives during a ceremony at Norfolk Southern’s Inman Yard, a major hub of interstate commerce and intermodal transportation just northwest of downtown Atlanta. The engines are branded “Eco” locomotives for their operating efficiencies in reducing emissions and fuel consumption. The 3,000-horsepower engines meet the U.S. Environmental Protection Agency’s strict Tier-3 emissions standards for locomotives. Norfolk Southern’s Atlanta yard eventually will put to work 10 low-emissions Eco locomotives this year. Annually, the 10 units will account for 6.6 fewer tons of particulate matter and 155 fewer tons of nitrogen oxides pollutants generally associated with smog and acid rain. As more Eco units are delivered to Atlanta in 2016, the clean-air benefits will be even greater. Additional CMAQ grants will lead to future placement of Eco locomotives at Norfolk Southern’s rail yards at Macon and Rome, Ga., and at Chicago. In Georgia, Norfolk Southern employs 4,735 people and operates a network of 1,779 rail miles. The company annually transports 1.3 million shipments by rail in the Peach State alone, totaling 55 million tons of freight for some 1,200 customers. Together with industrial development activity that brings new business, jobs, and investment to Georgia, and service to the state’s ports, Norfolk Southern’s rail network connects Georgia communities to the marketplaces of the world.